Unfortunately, this toy is no longer being produced. We are still looking for the best alternative. 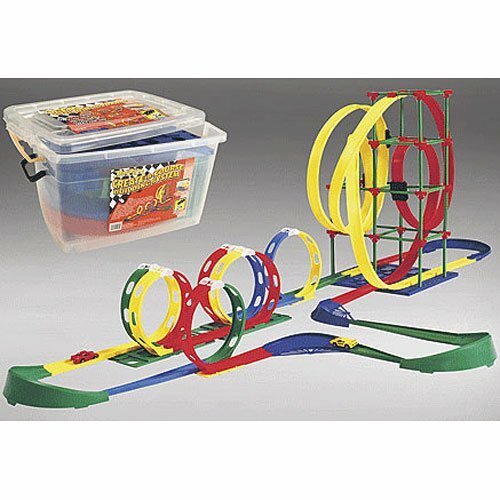 The Create-a-Course Building System is a build-your-own racetrack kit. Children can choose from 150 pieces to connect and bend to make their own track. No batteries are required. A few wind-up Darda cars are included. There are newer models that are similar to the classic Darda Building System like the Fireball Climb and Motor Speed Racer. The Fireball Climb makes cars travel even faster, and the Motor Speed Racer includes a red ferrari. The Darda Create-a-Course Building System has 150 pieces that children can mix and match to build their own racetrack. The set also comes with instructions for thirty different race car layouts. 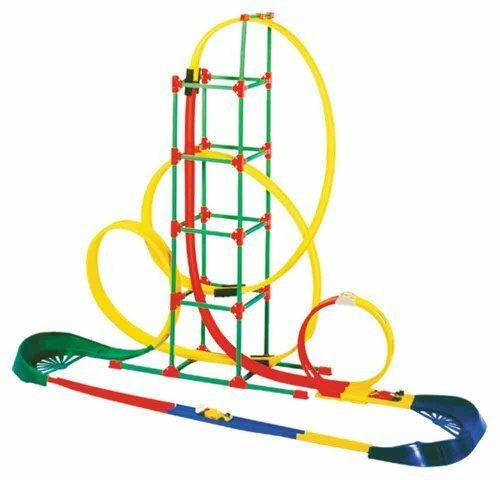 There are several colorful, flexible tracks that children can put together and bend any way to make a race track with curves, loops, and hills. There are also small cars that come with the track. You have to wind them up and then they will race down the track. The toy comes with an instruction booklet that includes thirty racetrack layouts that can be made with the pieces. The Darda Create-a-Course Building System is a build-your-own racetrack kit. There are a total of 150 pieces, so children can build many different racetracks at once. There is an instruction booklet that comes with thirty pre-designed racetrack layouts, but users have said that children really enjoy using their imagination and building their own tracks. The plastic tracks and cars are durable and very flexible. They can be bent any way to create customized racetracks. To make the cars move, they have to be wound up. Reviewers said that once kids wind them up and let them race, they go incredibly fast. Since the cars are wind-up toys, they don’t require batteries or electricity. Users mentioned that because they can be bent in any direction, there are endless ways to configure a track. Some users had complaints about the plastic storage container that all the parts come in. All the pieces come inside the container, but once they are taken out, it has been said to be impossible to fit all of the pieces back inside the box. Some reviewers said they had to get a bigger storage box to store all of the parts. The toy includes 150 pieces, including long, flexible, colorful race track pieces and small wind up cars. The parts come in a large plastic storage container. All parts are made of plastic. Several users had concerns that once all the pieces were taken out of the box, they didn’t fit back in. The parts are all stuffed into the storage container, and so once they are taken out, it can be hard to stuff them all in again, so some users recommended using a second storage container or a larger box to hold all the pieces of the toy. Discover the magic of Darda race sets. A simple back and forth motion is all it takes to send cars speeding along the race course. Design your own spectacular race course with this track set. This huge 150-piece set includes two race cars, upside-down loops, turns, towers, bases and plenty of track so you can create numerous course configurations. And, when you're done playing, all the components can be packed away in the handy plastic storage container. Set is compatible with all Darda race cars. Set comes with car, track and instructions for 30 layout.